A number of different survey results confirm the high regard Americans have for the military. Our annual confidence in institutions update shows that the military scores higher than any other single institution in public confidence rankings. Americans give military officers high honesty and ethics ratings, usually near the top of the list of all professions tested. This past January, Americans indicated they were more satisfied with the nation's military strength and preparedness than with any of 21 other aspects of the nation's current situation. Do these positive attitudes toward the military translate into strong public support for an increased military budget? Not necessarily, according to Gallup's latest update of two trend questions asking about U.S. military funding and military strength. Both questions use a three-part response structure. The first asks if current spending on the military is too much, too little or about right. The second asks if the U.S. national defense is stronger than it needs to be, not strong enough or about right. On both questions, the majority of Americans express views consistent with not spending more on defense. Given the three choices, 25% of Americans this year say the U.S. is currently spending too little on the military. Thirty-one percent choose the comparable response on the other question, saying the U.S. national defense is not strong enough. On both questions, the majority of Americans say either that things are about right -- by far the most commonly given response -- or that defense spending is too high/national defense is stronger than it needs to be. These attitudes are not new. Never in Gallup's decades-long history of asking these questions have a majority of Americans said that the national defense was not strong enough. 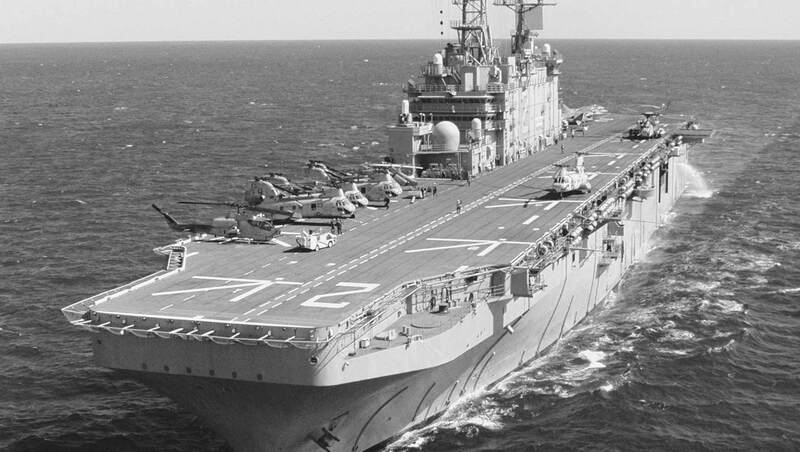 Only once did a majority (51%) say defense spending was too little -- in January 1981 as Ronald Reagan took office after arguing in his winning presidential campaign that the nation's defense had become too weak under Jimmy Carter. The results suggest that President Donald Trump's current call for a substantially increased military budget in future years is not congruent with American public opinion. Americans clearly respect and appreciate the military, but generally perceive that the nation's national defense is strong enough (or even too strong), and that current defense spending is about right (or even too much). As my colleague Lydia Saad summarized in her recent report on these data, demand is waning for higher defense spending. There is some fluctuation from year to year in attitudes about defense, partly reflecting the actual military budget. It appears that some Americans shift their opinions about defense spending in light of what is actually being spent, certainly not an irrational thought process. I looked at the trends in the nation's defense budget (as reported by the Office of the Undersecretary of Defense) and the percentage of Americans saying the nation is spending too little on military spending. The statistical correlation between these two variables since 2001 is -.46, meaning that as defense spending goes up, the percentage of Americans saying the nation spends too little goes down. In particular, the "too little" response edged down below its average in the years between 2006 and 2013, when the defense budget was above its average for the 2001-2019 period. The "too little" responses moved up in 2015 through 2018 after the defense budget drifted downward. Then, this year, the "too little" response dropped significantly, after a modest increase in defense spending in 2018 and the much higher military budget for 2019. 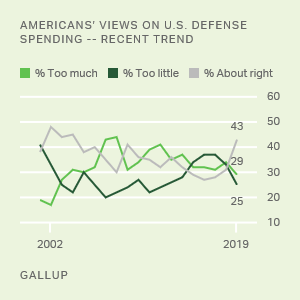 The big picture in American attitudes about defense spending, it's important to remember, remains fairly stable, with Americans almost always saying that spending is either about right or too much. But the congruence between the changes we do see and actual defense spending suggests that some segment of the public is either cognizant of the defense budget or is reacting to what the president or the media are saying about defense. At this point, Trump's frequent comments about the need to increase military spending, his announced higher defense budget, and the fact that he is a pro-military Republican president may have resulted in a heightened belief on the public's part that the nation's military spending is about right or even too much. For those who argue that the U.S. needs a much bigger defense budget in the years ahead, Americans' upbeat feelings about the military and about the strength of national defense could actually be an obstacle -- leading to the complacent conclusion that the military budget doesn't need to be increased. If things are going well (and if the budget has already been increased), why the need to spend more? Presumably, and somewhat paradoxically, if Americans felt less confidence in the military and were less satisfied with the nation's defense strength, support for increased military spending might be higher (as it was at the end of the Carter administration, as noted). The challenge for Trump and Pentagon leaders is to explain why the excellent job the military is doing today (as perceived by the public) translates into the need for more and more military funding tomorrow. This is particularly true at a time when many leaders in the Democratic-controlled House are focused on healthcare, climate change and inequality -- which they see as the major existential threats facing the nation. Trump's insistent focus on immigration as the nation's No. 1 crisis may also, perhaps paradoxically, lessen Americans' agreement that the military budget needs to be increased (and all of this is made more complex by Trump's attempt to borrow from the military budget to fund construction of the wall at the Southern border). All in all, two things are clear: 1) The public admires the military and is satisfied with the current state of the nation's defense, and 2) the majority of the public sees no need for more military spending, particularly now that the military budget has already been increased.